With ThinkTel, your SIP Trunks can be configured with Capacity On Demand. Also known as "channel bursting," it allows your business to manage spikes and drops in usage. With the ThinkTel uControl portal, there's no more calling your communications provider to add, delete or change numbers. SIP Trunking complements or replaces traditional telco ISDN-PRI or business line services with a more efficient and cost effective solution. A single SIP Trunk contains voice channels for bi-directional calling, and “direct inward dialling” (DID) local phone numbers. Session Initiated Protocol (SIP) has become the industry standard protocol for enterprise grade VoIP service providers and hardware manufacturers. 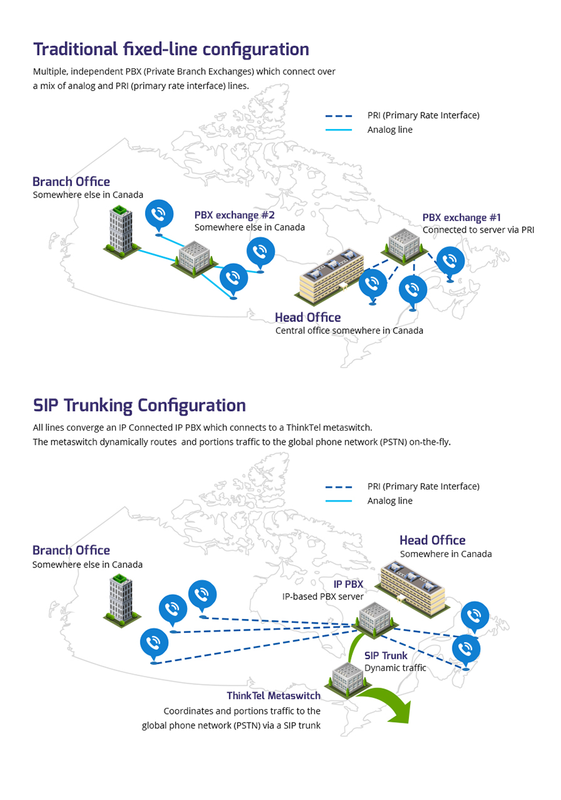 I already know about SIP Trunking. Great. Then you need some tech specs for how to get up and running. Download our Tech Specs to see what you need. I’m still unsure what a SIP Trunk is—do you have a diagram or a picture? So why is this better for my business? In short, SIP Trunking helps unify your communication strategy, and probably most importantly, dramatically reduces your telecom expenses. OK, how, exactly, does SIP Trunking reduce my telecom expenses? It allows you to manage the same call capacity with fewer lines (or “channels”). With Capacity On Demand, you can handle any call volume by only paying for what you need, when you need it. The best way to think of it is like an energy model—except without all the fluctuating hourly prices and additional charges. You can also create a local presence and eliminate long distance charges by selecting local phone numbers. So do I need a SIP Trunk for each city? With us, no. We give you one SIP for the entire country. Other providers may sell you channels at, say, $12.50, but you have to purchase one for Edmonton, one for Toronto, one for Vancouver or any city you want to be, or are already, in. That’s similar to a PRI model. ThinkTel offers you one Trunk not just for the entire country, but the entire world—over a single Trunk. You pay for what you use and there is no relationship between the telephone numbers and the channels. I’ve heard there are issues with toll fraud around SIP Trunking. You heard right. Your phone system can get hacked—even legacy phone systems can get hacked. What they do is hijack your line and sell them online in high cost regions. To combat this, we keep an eye out for anomalous traffic and shut down any traffic to high cost or odd areas. Then we’ll call you to verify. It’s no different than what your credit card company does. What equipment do I need—phone systems and so on? We’re directly certified to 80 different PBXs. You can check them out here. Did you know we have a lab where we test equipment? We do. So if you’re hooking your phone system up to a Panasonic, we have documentation for you and can connect you with someone who will walk you through the process. You can also download our tech spec sheet for more info on what you need to get setup. I almost forgot—can I run fax over a SIP Trunk? A lot of companies we speak with forget about fax. But yes, you can. I still have more questions but I’m tired of reading. Let’s set up a time to speak and we’ll answer any other questions you have.